© AFP/Getty Images Honduran migrant caravan on the Guatemala-Mexico border bridge in Ciudad Hidalgo, Mexico. Dozens of Hondurans fleeing poverty and violence abandoned their efforts to cross through Mexico to the US amid mounting fear and exhaustion, more than a week into the gruelling journey north. As many as 4,000 Hondurans, including pregnant women and children, remain trapped at the Guatemala-Mexico border awaiting permission to continue the long journey to the US. The caravan of thousands started as 160 people nine days ago but its numbers have swelled as more have joined in an attempt to leave poverty and violence behind them. Now a minority have turned back, using transport organised by Guatemalan security forces. “I’m going back because I’ve had enough, and this might be my only chance to go back safely, guarded by policemen,” said 17-year-old Byron Espina from Copán. Espina worked as a coffee picker in a small village called La Entrada, making only pennies, he said, and had hoped to find work in the US. Free buses started arriving late on Friday night, just hours after Mexican riot police had hurled teargas bombs into the frustrated crowd after some migrants broke through a riot-shield cordon to enter Mexican territory. Mexico’s president, Enrique Peña Nieto, said on Saturday that the caravan of people could seek asylum or enter with the right travel documents, but “irregular entry” would not be tolerated. Fearing further repression and long delays, some started boarding the buses destined for the Honduran border town Agua Caliente, where police have stopped hundreds of migrants from leaving the country to join the exodus north. The escalating intervention by security forces is seen as a direct response to threats by President Trump to cut off millions of dollars of aid to Central America and Mexico if they fail to stop the caravan – the second this year – reaching the US border. Migration is not a crime, and a regional agreement allows free movement for citizens of Honduras, Guatemala, El Salvador and Nicaragua travelling with national ID cards. The migrants and refugees are mostly fleeing a toxic mix of violence, poverty and corruption. On Friday night at least eight people were killed during shooting in a bar in Tegucigalpa, Honduras’s capital, one of dozens of similar incidents so far this year. Fewer than one in 10 crimes are prosecuted. Honduras is the most unequal country in the region: two-thirds of people live in poverty. The bridge connecting Guatemala and Mexico over the Suchiate river has become a makeshift refugee camp, with thousands of people, including entire families, forced to sleep, eat, and play outside, just metres from growing piles of rubbish. 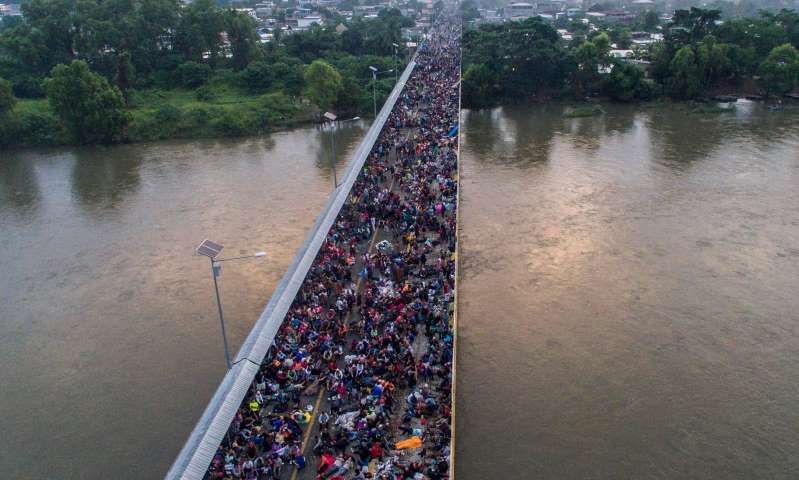 where journalist and ex-congressman Bartolo Fuentes – who was illegally detained and deported from Guatemala last week while accompanying the caravan – spoke to the crowd. “I have seen mothers cry about the bodies of their children. Parents receive the coffins. I hope this stops. Meanwhile, we must accompany our fellow countrymen,” he said on Friday. Marta Sánchez, founder of the Mesoamerican Migrant Movement, which organises an annual caravan of mothers searching for their children who disappeared while trying to reach the US, said: “This is not a caravan, it’s an exodus.